Let’s not beat around the (now brown and undernourished) bush: it’s been hot in the UK and across most of Europe for some time now. 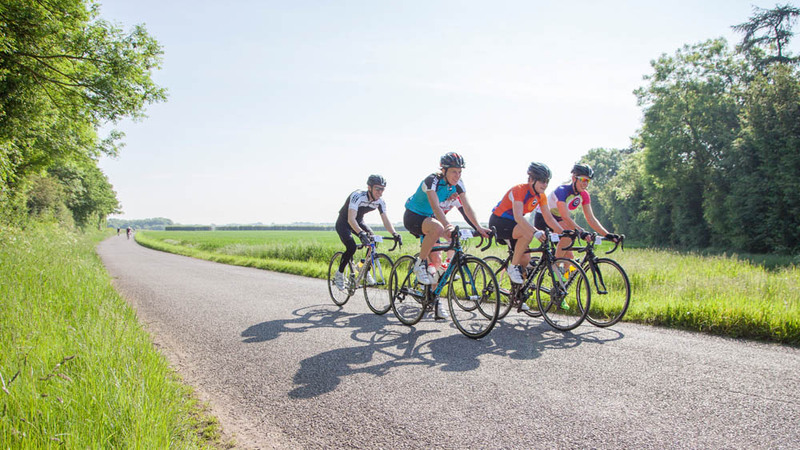 The heat wave is set to continue, which is great news if you like the sun but not ideal for your cycling life if you struggle to ride in the heat. Riding in the heat may be far more appealing than venturing out on a grim winter’s day, but it comes with its own set of challenges to overcome as your body deals with high temperatures. We’ve put together five simple tips to follow to help you avoid some common pitfalls when hot-weather riding. 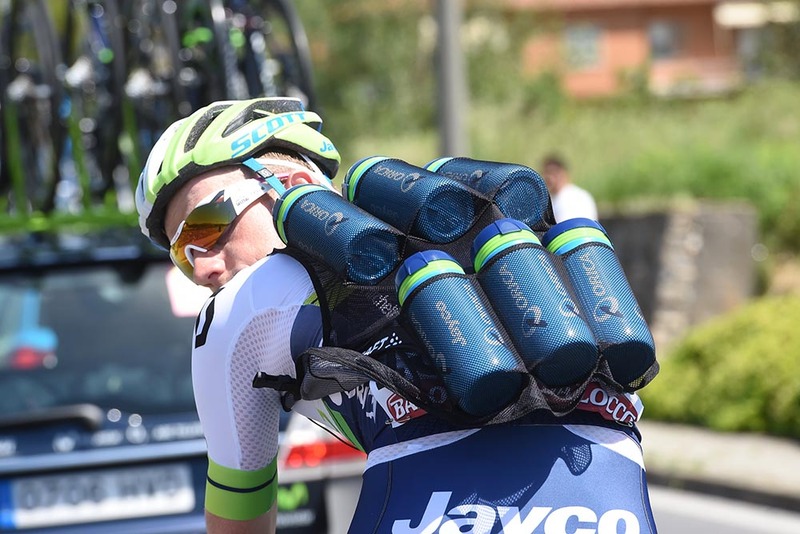 One of the biggest obstacles with cycling in hot weather is maintaining adequate hydration. You will sweat more as your body naturally tries to cool itself down, but that sweat will evaporate quickly, meaning that it is hard for you to gauge exactly how much fluid you are losing. Drink little and often when riding, and make sure that you have plenty of drink with you or know of places on your route where you can obtain more drinks – as if a mid-ride café stop needed an excuse. It is amazing how much drink you can get through on a hot day – drinking two full bottles during a long ride is pretty normal. The worst thing you can do it drink only when you become thirsty, keeping sipping from the beginning of your ride until the end. Using drinks with electrolytes can be a good idea to replace those lost by sweating, which can cause cramping. Packing ice cubes into your bottle before you leave will help keep your drink cool, at least for the first half an hour. The harder you work the more you will sweat, so if it’s really hot and you’re starting to feel it, romping through your drinks, knock off your pace or shorten your ride. And don’t forget in among all the drinking to pay attention that you are eating enough on your ride, too. With a huge array of technical cycle clothing now available on the market at a whole range of prices, there’s really no excuse to be throwing on your long-sleeved winter jersey when its 30 degrees and boiling-in-the-bag. Lightweight materials with wicking properties will help you cool off and prevent the uncomfortable build-up of sweat. A full-length front zip can help you regulate temperature, and a lightweight base layer can also aid the removal and evaporation of sweat from your skin. The breeze you create by riding along has its own cooling effect, and it’s sometimes only when you stop riding do you appreciate exactly how hot it is. Fingerless track mitts are a better idea than no gloves, as sweaty palms can become sore when gripping the bars. Lightweight, sweat-wicking cycling socks are also very cheaply bought from any cycling retailer. A well-fitting pair of shorts are also essential, any rubbing on your delicate parts exacerbated by sweat can cause uncomfortable soreness very quickly. Applying chamois cream before a ride can help. Wear sunglasses with 100% UV filtering lenses to prevent damage to your eyes and stop dust, bugs and flies taking a bath in your eyeballs. Having dealt with snow, ice, rain and potholes during the winter, summer brings a different set of road conditions to be wary of. On very hot days, tarmac can melt, causing patches of slippery or sticky tar as the road surface lifts off in the heat. Aside from the danger of riding on an unstable surface, the tar can become stuck to your tyres, attracting grit and dirt. 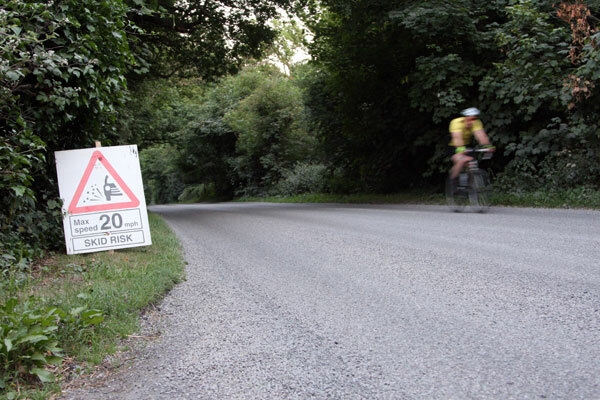 Many British councils also use the summer months to surface dress backroads – a process where liquid bitumen in pour on the road surface and a layer of gravel is added. Excess gravel can then accumulate in loose patches, particularly at the side of the road and at junctions, causing tyres to lose traction. Also watch out for wet roads after a summer storm, they can be very greasy, particularly under dense trees. While some cyclists are proud of their cycling tan as a badge of honour, others find it embarrassing to look as though you are still wearing a white T-shirt when you take your top off. But laughable tan lines are not the main concern – damaging sunburn and the risk of skin cancer due to excessive ultraviolet light exposure are a problem. Wear sunscreen (see a list of the best formulas for cyclists here) on the exposed parts of your body: arms, legs, face and in particular the back of your neck. The position on your bike means that the area on the front of your legs above the knee and calves will be exposed to sun more than other area of your legs. A very obvious way to avoid the severity of the sun’s rays is to avoid the hottest periods of the day for your cycling trip. There’s plenty of daylight in the summer months, so heading out early or at the end of the day can still mean you are riding in the warm, but without many of the hazards. 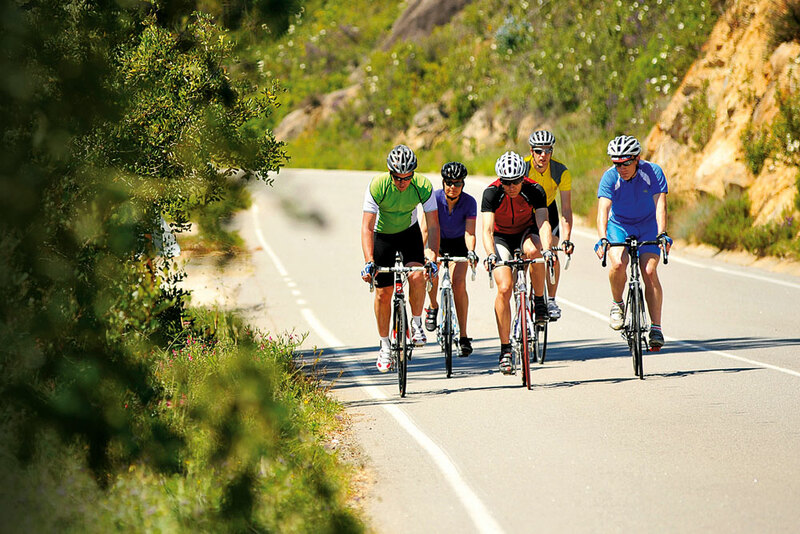 Riding in the morning or evening can have its own benefits – quieter roads, and spotting wildlife that is usually hidden away as the sun fully rises in the sky. If you ride in the evening, make sure you are equipped with lights in case you’re enjoying yourself so much you get caught when the sun goes down. Night riding can also be fun with a decent set of lights – you’ll see familiar roads literally in a new light. Packing a lightweight windproof or gilet in a back pocket on an evening ride might also be a good idea if the weather cools down as the sun sets.